The following procedure can be used to remove thel RF deck chassis from pedestal cabinets like shown in the picture. For other Henry RF amplifier pedestal types, this procedure should be very similar, however some screw locations and band linkage maybe different. 1) Remove AC power, transceiver and antenna connections. 2) Remove the bottom rear pedestal power supply cover (6 screws total). There are no nuts. This is the rear cover with the air filter. 3) Remove the top ventilated cabinet outer cover (4 screws total). There are no nuts. 4) Remove the inside RF deck shield (9 screws total, 6 inside and 3 from outside rear top) There are no free nuts. 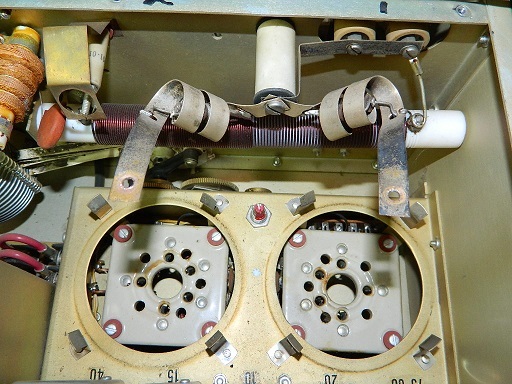 6) Looking down inside the top of the pedestal cabinet, in-between the internal RF deck chassis and the front panel, you will see a "lip" on the bottom of the RF deck with two or three nuts holding the RF deck to the top pedestal cabinet. The screws for these nuts can be accessed from either the outside bottom of the top pedestal cabinet, under the front panel, from the top of inside of the bottom power supply section. Remove the screws and nuts. 6) From inside the power supply section of the pedestal cabinet, about 1/2 inch in from the rear in the top you will see three screw which screw into the top RF deck chassis, Remove these three screws. There are no nuts. 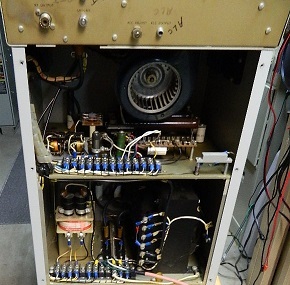 7) From inside the power supply section of the pedestal cabinet, on the bottom of the top RF deck chassis, unscrew the HV cable connector, then unplug the 8 pin octal plug and the square filament plug from the RF deck. 8) Slide the internal RF deck chassis out of the top of the pedestal cabinet. All the above steps may read like lots of complex work, however once you have performed this, you will see its quite simple and should only take about a 5 minutes to complete. With the RF deck on the workbench, remove the chimneys, tubes and bottom RF shield with all the counter-sunk Phillip screws. I recommend at this time to use compressed air and blow all the dirt and crud out of the RF deck before going any further. Assemble the amplifier in reverse order as described above.